As a group – truth, joy, love and a great deal of excitement. With two concerts remaining on their 2012 tour schedule, The Vespers relaxed in the comfortable confines of the Cup ‘O Joy’s artist lounge while the opening act began their set. The four members of the group seemed typically youthful and driven as most new artists are. What soon became apparent were their chemistry, maturity, and faith. The Vespers consist of two sisters and two brothers of different families. As serendipity would have its way, they met in Nashville (their hometown) through mutual friends. 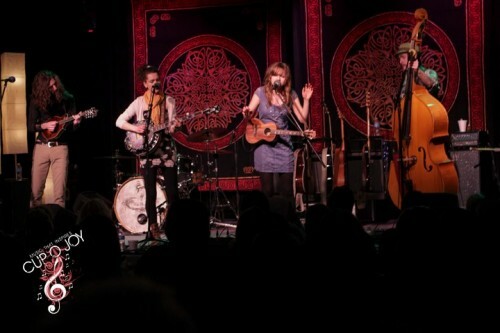 Band members include Callie Cryer (vocals, guitars and electric bass), Phoebe Cryer (vocals, guitars), Bruno Jones (guitars, bass, backing vocals) and Taylor Jones (drums, percussion, mandolin, backing vocals). After three and half years of constant touring and two albums they have found their stride, their public, and success but have not lost their values or their humor. Question: What would you like to include in this interview that you haven’t been asked before? Callie Cryer: We usually get it all in! Taylor Jones: Well, to start, we really love to play. But more than playing or singing we have joy in entertaining. It can be a challenge to entertain. As a band we try to come from a broader perspective when we entertain. Q: What emotions are you trying to evoke with your music? Bruno Jones: We do have an angry rock-out song! T: Reactions are key. What do people react to? We take responsibility for the emotional roller coaster we develop. (Laughs all around.) Reactions should include laughter, thought provoking moments, joy, Christian messages – hopeful messages, some sad tones. An emotional ride. Q: Where do you gather inspiration for your music? Phoebe Cryer: Everything, everywhere. Lines from spoken or written works, random experiences. T: People or things that have rocked my world. If I wake up the next day still thinking of an experience it makes me take the time to discover what it is. Q: Like a great picture, the inspiration stays with you. This is true of any art. Do you find this is true for you? T: Yes, the longer we do this (music, touring) the more it is like a social experience, we take pride in how the team entertains and the impact it has. As a team, we do much better than we would as solo acts. P: The best instrumentalists can do all their fancy tricks and not move anyone. T: The audience, being in touch with what people are into, is the fuel for our success - their reactions through our art. So much good comes from talking to the audience, relating and conversing with the audience. This is a luxury we have at this point in our career. The name of our current album, The Fourth Wall, comes from this experience. The breaking down of the proverbial wall between the artist and the audience, keeping in touch with the audience. Q: Do you find this is the true heart of the artist. T: Yes, connecting with the audience each night keeps us on the same plane as the audience. It is critical to remember we are all alike, we are all seeking something. Q: What part of yourself do you put into The Vespers music? C: This is the only outlet I have musically. There is not anything I don’t put into it. Whatever I’m feeling or wanting to get across in writing or performing, everything is included. Having said that, I am a private person. But I live and perform in the moment, to my fullest ability. T: I try to offer my strengths while not overshadowing the strengths of others in the band. contribution is rhythm, in writing my contribution is real life perspective. P: I give it all, my heart and soul. If I’m going to do something I give it everything I have. From a musical perspective, this is inclined toward Americana, folk not pop. This is true whether I’m writing or playing guitar. I’m all in. The interview comes to a close and the concert takes of in full throttle with “Grinnin In Your Face” as Callie sings lead with great emotion and Bruno plays acoustic slide like an old bluesman. Favorites include rockers “Lawdy”, “Got No Friends” and “Close My Eyes”. Others take on an deeper emotional flavor with “Better Now” based on the story of the blind man in the Bible, and "Flower, Flower", a lighter more joyful offering. Bruno – the melody, guitarist and bass extraordinaire!